Preoperative anemia is a risk factor for acute kidney failure after high-risk surgeries. We assessed the impact of preoperative anemia on kidney function in an obese Asian population after laparoscopic bariatric surgery. 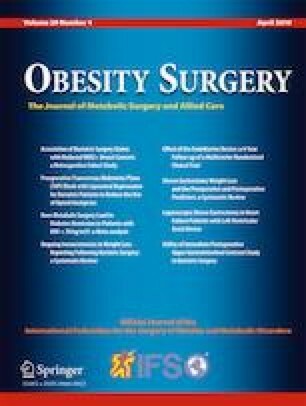 Patient characteristics, comorbidities, type of surgery, perioperative profiles, eGFR, and micronutrition were retrospectively reviewed in 341 patients with obesity undergoing bariatric surgery. All patients, who had a preoperative estimated glomerular filtration rates (eGFR) ≥ 90 mL/min/1.73 m2, were followed for 1 year and assigned to one of two groups: anemia or non-anemia group. Preoperative anemia was determined based on hemoglobin concentration. The Pearson’s correlation coefficient between preoperative body mass index (BMI) and preoperative eGFR of all patients was 0.169 (p = 0.005). Preoperatively, there were no significant differences in age, BMI, and eGFR between the anemia (n = 38) and non-anemia groups (n = 303). Patients in the anemia group had lower hemoglobin concentration at baseline, 1 month, and 12 months after surgery than those in the non-anemia group. Postoperative eGFR levels at 1 month (p = 0.993) and 1 year (p = 0.118) as well as hospital stay (p = 0.941) were comparable between the two groups. However, the percentage weight loss was significantly higher in the non-anemia group than that in the anemia group 1 year after bariatric surgery (30.0 ± 7.3% vs. 27.0 ± 8.1%; p = 0.041). Preoperative anemia did not negatively impact kidney function following laparoscopic bariatric surgery during the 12-month follow-up. Considering the potential adverse impact of anemia on postoperative weight loss, preoperative correction of anemia may be recommended. Kuo-Chuan Hung and Shao-Chun Wu contributed equally to this work compared to the first author. Cheuk-Kwan Sun and Tien-Chou Soong contributed equally compared to the corresponding author. The protocol of the whole study was reviewed and approved by the institutional research board (IRB) (Approval No. 20181119B). Informed patient consent was waived due to the retrospective nature of this study. This article does not contain any studies with human participants or animal performed by any of the authors. For this type of study, formal consent is not required. Informed consent does not apply to the submission.